Round silver ball shaped with protruding arms and a hollow base opening. Each fine silver spike is individually forged by hand hammering. In the process of assembling, the special welder TIG is applied. To keep the pure white colour of fine silver, it is intentionally left at the annealing stage, then the tip of each spike and the inside of the hole is polished to enhance the contrast of the finishing colour of silver. Purchase of 'Silver Organism #5' (2001) supported by the Nick Arber Memorial Fund. 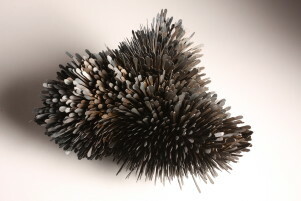 Silver Organism #5, Junko Mori, 2001, Crafts Council Collection: M72. Purchase of 'Silver Organism #5' (2001) supported by the Nick Arber Memorial Fund. Photo: Todd-White Art Photography. I am always drawn to the visual impact of an aggregate assembled with many small components and find infinite possibilities of the form multiplied by the vital power beyond the physical space, such as cell division through a microscope. My work consists of multiples of individually forged steel or other metals, and the subtle difference of each piece results from hand hammering. No piece is individually planned but becomes fully formed within the making and thinking process. Repeating little accidents, like a mutation of cells, the final accumulation of units emerges within this process of evolution. The uncontrollable beauty if the core of my concept. I hope my objects become highlights in a contemporary minimal space as catalysts of a new decorative art.